Annually the 42nd Colombo Gold Troop conducts this Inter Patrol Competition Camp to select the best patrol of the year. This competition started in 1986 and the shield was donated by Mr. Sanjeewa Kongahawita which was named as Lt. Col. M.K.J Cantlay Challenge Shield in respect of Lt. Col. M.K.J Cantlay, the founder of Scouting at Royal College. Salalihini Patrol lead by Sachindra Kongahawita won the Lt. Col. M.K.J Cantlay Challenge Shield during the first year. Since then the patrols of the Gold Troop battle it out every year to win this shield, during the 3 day competition camp where more than 80 competitions are conducted. 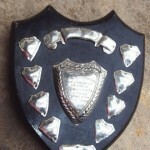 Following are the patrols that have won this prestigious shield so far.